Free FLV to MP4 Converter for Mac provides strong functions of video effect editing, such as merging several videos into one file, customize video and audio ecoding parameters used by encoder: &quot;Resolution&quot;, Video Bitrate, Frame Rate, Audio Channels, Sample Rate, etc. If you want to merge the selected contents into one file, you can check the &quot;Merge into one file&quot; option. As default the merged file is named after the first selected file (either a title or a chapter). Statement: First, please download the orginal installation package by clicking the download link. Of course you may also download it from the publisher's website. Using Free FLV to MP4 Converter for Mac crack, key, patch, serial number, registration code, keygen is illegal. The download file hosted at publisher website. We do not provide any download link points to Rapidshare, Hotfile, Depositfiles, Mediafire, Filefactory, etc. or obtained from file sharing programs such as Limewire, Kazaa, Imesh, Ares, BearShare, BitTorrent, WinMX etc. Software piracy is theft. 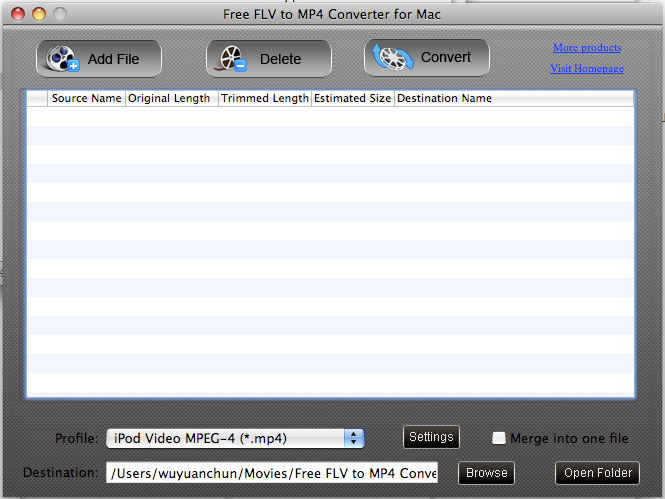 If you like Free FLV to MP4 Converter for Mac please buy it.